The Riviera Nayarit is one of the few places in Mexico where you can enjoy this unique and very fun extreme sport, which will be available to visitors year round. Any destination truly committed to tourism is forever seeking new ways to satisfy its markets. So it is with the Riviera Nayarit, which has made a name for itself in the extreme aquatic sports arena thanks to its wide variety of products and services. The latest addition this season has been the Flyboard, a unique activity that can be enjoyed in very few places in Mexico—including, of course, in the Riviera Nayarit. Vallarta Adventures added this tour in November, an activities that literally flies over the water and will be available for all of 2013. 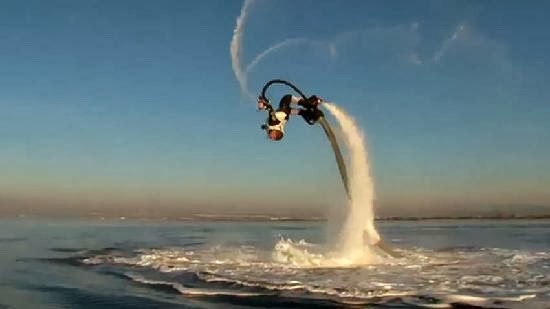 The Flyboard was created a couple of years ago in France by Franky Zapata, who managed to make two of man’s dearest dreams come true: to fly like a bird and to swim like a dolphin. “We offer a product that’s totally trendy and world class. It definitely separates the destination from the others, making it much more attractive to the segment of visitors that seeks out this type of adventure,” said Flyboard instructor, Peter Romero. The philosophy shared by the Riviera Nayarit Convention and Visitors Bureau and Vallarta Adventures centers on scouting for and bringing in the latest trends and offerings in the adventure sports arena. 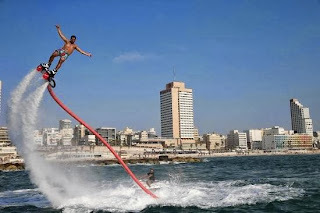 Flyboarding is, undoubtedly, on the cutting edge for extreme aquatic sports. A visit to the Riviera Nayarit implies having the opportunity to experience something unique, something that may be extreme but at the same time is easy to learn and, above all, lots of fun. “We’re committed to bringing innovative products that increase the value of our beautiful destination,” added the instructor. The beautiful contours of the bay lend themselves to several extreme and adventure sports, including Skydiving, Kitesurfing, Ziplining, Rappelling and more.